In 1940 during the London Blitz, Welsh secretary Catrin Cole (Gemma Aterton) is hired by the Film Division of the British Ministry of Information to write "slop", i.e. the women stuff required "to cultivate a more convicing female angle", for propaganda/informational shorts meant to boost British morale while providing tips about growing carrots or speaking in careful fashion. Paired with cynical but dashing scriptwriter Tom Buckley (Sam Caflin), she soon embarks in a larger project: "The Nancy Starling", a based-on-a-true-story film about two sisters who allegedly took part in the Little ships of Dunkirk flotilla. While the "true story" turns out to be largely fictional - the sisters' boat didn't make it out of the port and had to be towed back - the "Nancy Starling" scenario eventually morphs into a uplifting story of British bravery and stiff upper lip, and a American pilot (played by an actual American pilot with no acting abilities) is added to the plot to appeal to American audiences. While the war rages on, Catrin struggles with the usual demands of filmmaking - how to make a story appealing, how to juggle with the egos of fellow writers and actors -, the demands of wartime propaganda and, of course, the fact of being a woman at a time when the lack of available men made it possible for women to enter traditionally male professions. Directed by Danish filmmaker Lone Scherfig (who did the wonderful An Education in 2009), Their Finest is a little gem of a WW2 period drama. There's little we've not seen elsewhere - the movie-about-making-movies, the screwball romance banter between the two leads, the bickering ego-driven film crew, London under the Blitz, the "print the legend" concept - but it all comes together nicely, and with some surprises along the way. The cast is stellar: it's the second good movie in a row for Aterton after The girl with all the gifts; Bill Nighy is at his Bill Nighiest as the hilariously vain former matinee idol Hilliard, but with a tinge of sadness; Sam Caflin is definitely more than a pretty boy (and he doesn't have to compete with Emilia Clarke's eyebrows as in Me before you); and smaller but memorable parts by Helen McCrory, Eddie Marsan, Jeremy Irons, Rachel Sterling (Olenna Tyrell's daughter) etc. These reviews from Vanity Fair and The Guardian praise the movie much more eloquently than I'm able to do. Note: while Their Finest is often comedic (with some romance), it's also a war movie that gets pretty dark at times, and Scherfig does a good job with the tone shifts. The Finest also works as a meta commentary on Dunkirk. In Dunkirk, the character played by Mark Rylance does exactly what the sisters in Their Finest allegedly did (but did not, though they tried). We know the flotilla was mostly manned by naval officers rather than by the boat owners: the choice of having a civilian as the hero is a propagandistic one, both in the real movie (Nolan's Dunkirk) and in Their Finest's movie-in-the-movie (The Nancy Starling). In Their Finest, Catrin gives herself the additional task of making the sisters - rather than the men on the boat - actually do something heroic (diving to fix the boat's propeller). 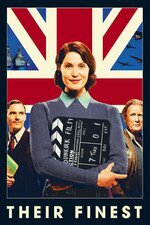 Of course, Their Finest is also propagandistic, but in a more subtle way: ultimately, it's about a brave group of British and not-so-British misfits - not-actually-married women, washed-out older men, gays, immigrants from Poland and Hungary - banding together and using their particular skills to fight Hitler, all the while dodging (and sometimes not dodging) the bombs falling on London. In addition: the character Catrin Cole is based upon the Welsh screenwriter and playwright Diana Morgan who worked at Ealing Studios throughout the 1940s. Unlike the fictional Cole, Morgan was an experienced playwright before the war. She did work on British propaganda movies, notably the highly successful Ships with wings (1941) - she was hired to write the love scenes but ended up writing the sea battles - and Went the Day Well? (1942), a surprisingly dark and violent war drama where British villagers, mostly women and older men, fight off German paratroopers. Thanks for this, I'd not heard of it. It sounds interesting. I saw this pretty early in the year, and it is still my favorite movie of 2017. It was really great. I really enjoyed this film. It was really well cast, and well shot, and well written. I really enjoyed this—it was a familiar story in many ways, yet had the capacity to surprise. I actually gasped at one point and said “No way!” The cast is excellent and so is the chemistry between the two leads. I was surprised by how much I liked this movie, discounting the plot twist near the end... I tried to recall an onscreen couple that I find as appealing, and had to cast my mind back to Veronica Mars and her Logan. The song "They Can't Black Out The Moon" has been lingering in my mind for days, this duet version is just lovely.